Finally doing something I've thought about for some time. I'm adding some back-up solar power capability on a very basic level. My backyard is sun challenged, neighbor's trees cast a lot of shade on my south side, but in winter, many of the trees shed leaves, and I get some good rays. 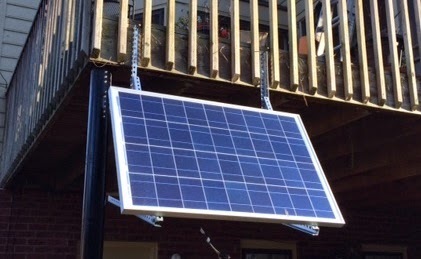 So, I'm installing a solar panel to see if I can keep a battery bank charged, maybe power some Ham radio gear, and keep Internet modem up and running in a power outage (if Comcast does it's part to keep its gear powered). 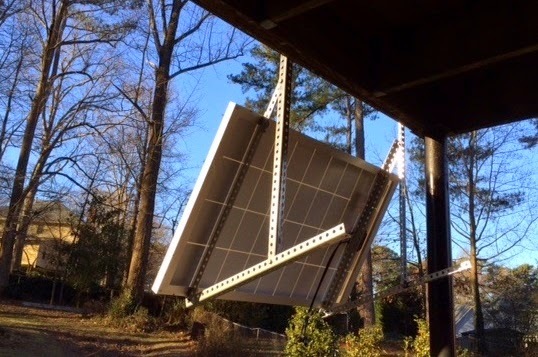 I'm starting with a 100 watt monocrystalline panel, and I've opted to hang it from my back deck. I used steel angle strips for mounting with 12 gauge for the main vertical supports, and 14 gauge for direct panel attachments and positioning bars. It's anchored with bolts through a pair of 2x10s that support my rear deck. Placement allows to convenient adjustment and other tinkering during experimentation, while still keeping the panel and supporters high enough to give most people head clearance. I'd get better sun exposure on my roof, but I'm adverse to heights. If the low hung panel shows good results, I might consider a roof top expansion later. On the other hand, if low hanging meets my needs, maybe another low panel would be the way to go. Hoping to get the panel wired to an controller and a battery bank next week. Initial bank will probably be three 12v 35ah AGM batteries wired in parallel. I bought the batteries recently as storm outage back ups, and currently deep them on an AC battery maintainer. Yes, there are bigger, deeper batteries available, but the 35ah size can be easily moved if I want to tote one off to a remote location for use with an small inverter. 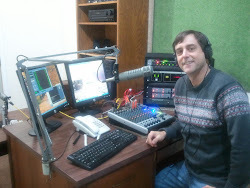 I bought two 300 watt pure sine wave inverters when I got the batteries. I have no ambitions of living "off grid" in normal situations. But I am looking to come up with some basic back-up for intermediate to long term power outages. I see solar as a means of powering communications, maybe a few low amp lights, and an occasional look at TV during a prolonged "grid down" occurrence. Even if solar fails to completely satisfy my emergency charging needs, I have a little gas powered generator that's ideal for running a regular battery charger. Power coming directly from the cheapo generator is probably too dirty to risk direct connection to pricey and sensitive electronics.